Simply type your Answers and clues in the boxes provided and click the ADD button. This will start to build your list. All answers must be 15 characters or less as the grid used is 15x15. There is a limit of 30 answers per crossword. Although it is possible that 30 answers will fit the more answers you enter the less likely that the system will successfully enter all of them. 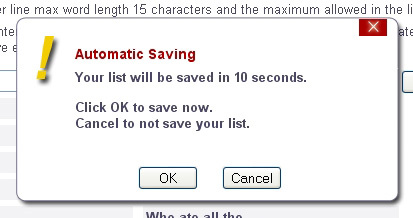 When entering the clues do not click away from the page unless you have clicked the SAVE button. This temporarily saves your crossword for about 20 minutes. While you are adding items to the list a box may appear stating that the list will be automatically saved. This will happen before the 20 minutes is up to ensure you do not loose your list should you go away from your computer for a while. You can edit and delete list items by clicking the small buttons provided. When you have entered all your answers and clues click the Create Crossword button. Depending on the amount of words you have entered this may take a few seconds to compute.